Veloce. In Italian it means fast. You might think the Italians at Alfa Romeo have forgotten that word, so slow they have been in returning to the U.S. market. However, today's Nice Price or Crack Pipe 2000 GTV proves you can still get an Alfa here pretty damn veloce. Well, Friday's short-lived dalliance with the Huffing-Paint Post meant that NPOCP had to sit out a day. Now that everything's back to normal, we're going to rock-on. Foghat, Blue Oyster Cult, Nazareth. Last Thursday's crazy color combination Cobra II could have had any of those ‘70s hard rockers playing on its 8-track stereo and it would have seemed wholly apropo. Not appropriate, however, was its asking price, as 56% of you felt that 90 horses weren't worth nearly eight large, no matter how well hidden were the Pinto dangly bits under the Cobra II's skirt. Sure, that refugee from the seventies may have represented that decade's tackier side, but that's not to say the era was completely was bereft of awesome cars, it's just that awesome back then wasn't quite as awesome as awesome is today. 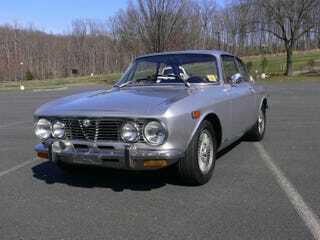 One car that was awesome then, and continues to be so to this day is the Alfa Romeo 2000 Gran Tourismo Veloce. in the seat. This 1974 2-litre is claimed to have been restored in 2006, the work done including a non-original, but seriously well chosen, red for those seats and much of the rest of the cabin. The Tipo 105 went through several iterations over its 12-year lifespan, including displacement bumps, body tweaks, and interior treatments. This represents the last version sold in the U.S., and it's one of the best. Intended as the replacement to Alfa's celebrated Giulietta Sprint Coupé, the Tipo 105 was one of Georgetto Giugiaro's first design efforts at Bertone, and it remains a classic. Close-coupled and glassy, it emerges as much smaller in person than you might think from the photos. The bulldog-like stance with its descending belt-line forces the center of power visually to the front, where naturally sits the 1,962-cc edition of Alfa's sweet twin-cam four. Being a U.S. car, this one originally came with SPICA fuel injection, and you'll find that mechanical delivery system still resident under its hood today. So outfitted the all-alloy engine made 130-bhp, which may not seem a lot today, but in comparison, that was only 6 short of what the 5-litre V8 available in last week's ‘70s Mustang put out. The 2000 offered only one transmission here, a synchro-eating 5-speed manual actuated through what feels like a yard-long stick. The seller says that this one stays in gear, indicating, hopefully, that a gearbox pull is still a ways down the road. And it's while on the road that you can see where these cars really shine. Based on a shortened version of the Giulia Berlina, the basic car arrived as the Giulia Sprint GT in 1963. Those early cars are affectionately referred to as the step-nose for the unique fit of the leading section of its bonnet. In 1967 the Giulia saw significant changes, including a restyling of the nose, and a restructuring of the nomenclature, the new model carrying the name 1750 GT Veloce, as well as a larger 1,779-cc engine. In 1971 the engine again was enlarged, through increases to both bore and stroke, to the 2-litres of today's car. Being a ‘74, this one also possesses the larger, and more alloy-ier ‘Turbina' wheels made available that year. It also comes with air conditioning, an option that helped make the car more desirable in the U.S., proving that Alfa wasn't always so averse to selling cars here. Not only is the Bertone body beautiful, but this one – in metallic silver – looks to be in fine shape. No trim nor badging is missing, all the glass appears un-cracked or hazed, and the seller claims that car is rust-free. On the downside, from what I've heard, these things are hard to fuel as the angle of the dangle on the filler pipe behind its door is not conducive to snooded pump nozzles. Additionally, it is a really small car, and while one or two will fit with only a little shoulder getting to know you, trying to pack four in would be akin to attempting non-consensual congress with a shih tzu. That size translates into light weight, and at about 2,650 lbs, there's not a lot for those 130-horses to have to pull around. Plenty of power, low weight, and a well-sorted suspension, it's no wonder these cars are so freakin' fun to drive. And even though Chrissie Hynde once claimed time's the avenger, this car's five year old restoration likely has given back much of what it may have lost over its 91,000 mile life. To add little Romeo to your life will cost $19,500. Hey! You know how many Mia*smack*. Sorry, had to get that out of the way. This 2000 GTV is a fairly unique proposition these days. It's sort of comparable to BMW's contemporary 2002tii, or. . . well, not much else. It sits in a niche that is not quite common car, and not quite super car, but no matter what, there's no denying that it's a desirable car. The question however, is whether it's $19,500 desirable? What's your take? Is that price as nice as the car? Or, is this an Alfa that they Beta lower the price on? AlfaBB Forums or go here if the ad disappears.